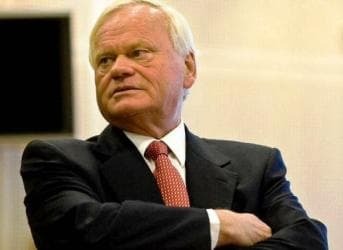 John Fredriksen, the shipping magnate worth $13.2 billion is one of the most powerful, respected, and even feared men in the global oil and gas market. He controls the world’s largest fleet of supertankers, the most valuable deep-water drilling company, and an armada of about 128 other vessels which transport minerals, grains, fish, LNG, etc. He told Bloomberg that he still “works on gut feeling,” and whenever his gut tells him to bet, his companies, Frontline 2012 and Seadrill, make the move. Currently his gut is telling him to invest in rigs and tankers. He’s investing $7 billion, via his company Seadrill, in 18 deep water rigs, and $4 billion in nearly 50 vessels designed to transport LNG, petroleum, propane, and other fuels, with the aim of increasing his dominance in the transport of all liquid fuels. He said that whilst the petroleum growth forecasts and economy are currently unfavourable, they are too unpredictable to be the basis for any decisions. Instead he is making his investments due to the low prices of vessels. Singapore yards are selling deep-water rigs at $535 million apiece, more than 31% lower than in 2008, and Chinese and South Korean shipbuilders are asking only $80 million for their supertankers, half of their cost in 2007. Other shipowners often follow Fredriksen’s lead. When he announced in February that he was building new tankers for his fleet, his rivals raced out and placed orders for 21 of their own. Although he must be careful not to flood the market with too many ships, which could force the price of daily charter down to unprofitable levels. Seadrill’s investment is high risk, and could seal, or destroy Fredriksen’s fortune. Some of the new rigs have already been taken on long-term leases by BP, however the companies $10 billion in debt used to finance the investments, is more than double its expected revenue for 2012. If the added number of vessels in the market drives down the charter rates, then Seadrill may find their debts in surmountable, as their profits dwindle. His next investment will be in developing a fleet of fuel saving tankers, which could drastically cut the daily operating cost of a tanker by as much as 20 percent. I know a little about Seadrill (SDRL) and by all measure, it appears to be a well managed company...It is currently on our watch list, as a potential purchase.. The stock also sports a divy of about 7.5%, which is well covered..Its debt load, can be addressed with its cash flow and generated profits.